Here in Fantasy we are not just travel junkies but cinephiles of the highest order. What better way to give you a preview of what you can see in Greece this summer than through movies? So let us transform to a modern Phileas Fogg and take you on a journey around Greece in 8 films! Let’s start by traveling back in 1957, when a gorgeous young girl named Sophia Loren was about to become the next big thing in Hollywood. During her humble beginnings, Sophia made a little-known film called Boy on a Dolphin, which takes place in Hydra, the hidden gem of the Saronic islands. Today Hydra is an ideal location for a low-key vacation and its close proximity to the port of Piraeus renders it a preferred destination for tourists and locals alike. Boasting a prominent place in a niche list of islands where cars are not allowed means that you’ll get to traverse the island’s trails untouched by urban worries. Just 4 years later a meeting of titans took place in a little corner of the Aegean. Gregory Peck, Anthony Quinn and David Niven came together in the action-packed Guns of Navarone. 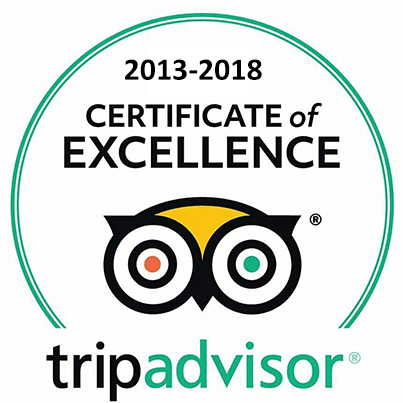 The award winning film has not faded from our memory and neither have Lindos or the St. Nicolas Bay which have become iconic landmarks in most of the island’s tours. Being one of the largest islands in the Mediterranean, Rhodes is home to numerous points of interest that can satisfy every taste. 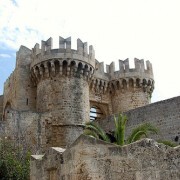 The island’s tumultuous history has left behind ruins from Ancient Greece, monasteries from the Byzantine period and medieval palaces and forts from the occupation of the Knights Hospitaller, making Rhodes a mosaic of history in the modern world. It didn’t take long for Anthony Quinn to return to Greece, for a role that would earn him an Academy Award no less. Bringing to life the titular character of Kazantzakis’ novel Zorba the Greek, it wasn’t just Quinn’s performance that enchanted our hearts but also the picturesque imagery of Crete and the small villages around Chania in particular. Even today, the town refuses to let go of its roots in the name of modernity and has thus created an idyllic atmosphere that takes you back to simpler times. Walk through the narrow streets that lead to the main port and you will discover shops and restaurants hidden away in quaint corners. This unique style is sure to enhance your trip with unforgettable experiences. When a world renowned thespian like Meryl Streep attaches herself to a project, you have to pay attention. Once you add the recipe of a successful musical based on the ever-popular ABBA you got yourself a hit in the form of Mamma Mia! In 2008, the thrice Academy Award winner took us on a journey to Skopelos and Skiathos, the pride of the Sporades islands. Meryl made us laugh, cry and most of all, fall in love with the magnificent beaches that surround these tiny slices of paradise. 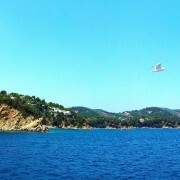 It wouldn’t surprise you to find out that the beauty of Skopelos and Skiathos has not been exaggerated in the least. Filled with isolated areas where you can take a swim and hiking trails leading up to churches, Sporades is sure to be the perfect destination for those who seek a quiet vacation with an adventurous twist. Staying in the Aegean, you can’t help but be tempted to talk about Santorini, home to the world’s most stunning sunsets. An island so famous that needs no introduction, all you need to convince you to visit is the opening scene of Lara Croft: The Cradle of Life. 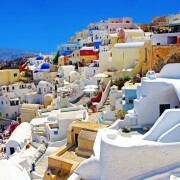 A glimpse of Fira from below is enough to make you want to share Angelina Jolie’s experience. Whether you choose to stay in the town exploring different wineries, take a tour of the ancient mountaintop city of Thera or visit the awe-inspiring volcanic crater of Caldera is up to you. Wherever the evening finds you be sure to look up at the setting sun with its golden crisp reflected in the calm sea and keep a mental memory of the wonderful juxtaposition of colors that are sure to stay with you forever. When you think of Greek islands, your mind might inadvertently go to the Aegean, but there is a whole other side of Greece that is worth exploring. In the west, you will find the Ionian Sea and a group of islands heavily influenced by Italian culture and thus possessing a very rare mix of Mediterranean style. 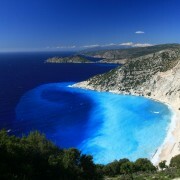 The largest and most prominent of the group is Cephalonia, featured in Captain Corelli’s Mandolin, a Nicolas Cage - Penélope Cruz collaboration. Even under a WWII setting, Cephalonia still oozes romance and lovely scenery every chance it gets. 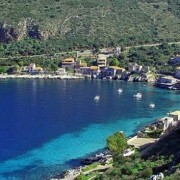 A vacation spot that is sure to attract couples that want to experience a summer of love in Argostoli or Fiskardo. In an era saturated with sequels, very few franchises have managed to consistently keep viewers more engaged with every iteration and Richard Linklater’s Before Trilogy certainly falls under that category. The third film, Before Midnight stayed true to the things that made us love and root for Jesse and Celine while managing to refresh the story with new challenges, always under the realistic prism of Linklater’s storytelling. This time around, an added bonus came in the form of the majestic setting of Peloponnese, where our beloved couple is vacating. From the magnificent vineyards of Kardamyli to the ruins in Messinia, we stand in awe of the elegant charm of the Greek mainland. 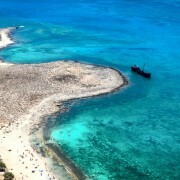 Who said island hopping is the only way to enjoy a Greek summer? Staying in the mainland, it is time to change pace, put on our suave and reminisce about our favorite British agent. It was the early 80s and Sir Roger Moore was the incarnation of 007. 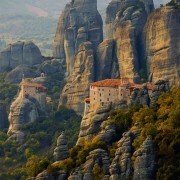 His latest escapades led him to Meteora, a geological marvel in the heart of Greece. Seeing is believing and this spectacular rock formation - a testament to the grandeur of nature – is truly a place that unless one visits, one cannot fully comprehend. The view of two dozen monasteries seemingly suspended in the air or hanging for dear life from cliffs that seem carved by a great artist will surely be a breathtaking experience For Your Eyes Only.